24 oz for carrying a large amount of liquids. Double wall construction for insulation of cold liquids. Ability to contain hot liquids up to 150 degrees F.
They have a textured nonslip sleeve to provide comfort and grip. 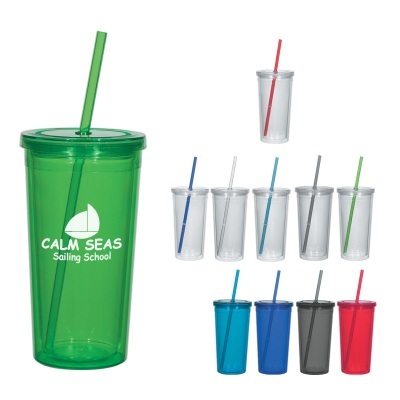 These acrylic tumblers come with a convenient screw top and a reusable drinking straw. Give us a call 706-374-0710 for a FREE quote and to put our years of promotional and advertising experience to work for you. Colors Available: Translucent: blue, charcoal, clear, green or red - all with matching colored straw. Translucent: clear with blue, charcoal, green or red straw. Custom Imprint Colors: These ink colors are our standard colors if a PMS Color match is requested add $50.00 per PMS color. PMS Color Match cannot be guaranteed.